Messico ouvero Nuova Spagna che Contiene il Nuovo Messico la California con una Parte de' Paesi Adjacenti. 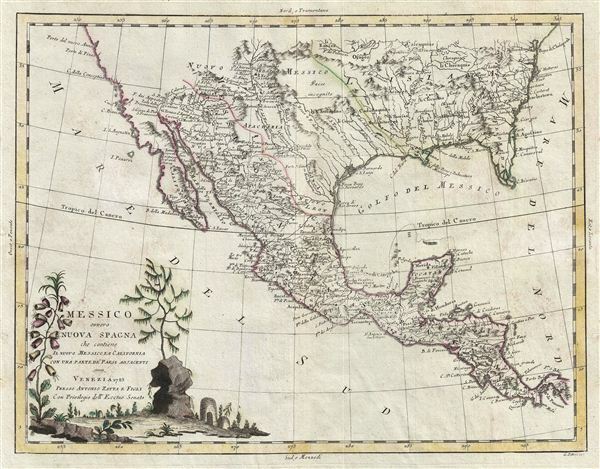 A nice example of Antonio Zatta's fascinating map of Mexico, Texas, Florida, Louisiana, and Central America. Centered on what would soon be known as Texas, this map covers from the Pacific to the Atlantic, and from the entrance to the Chesapeake Bay tot eh Isthmus of Panama. This remarkable map of the region, which predated Humboldt's landmark map of 1810, illustrates just how little was known of the American southwest north of Mexico. Cartographically Zatta offers little new information – for none was forthcoming form the Americas at the time – and derives most of this map from the work of Robert de Vaugondy, some 10 year prior. The mission settlements along the Rio del Nord (Rio Grande) are well noted, but other regions to the north and west remain paese incognito. Zatta sets the Rio del Palma as the northern border of New Spain (Mexico) and the border of Louisiana just west of the Mississippi, clearly defining the regional boundaries of Nuovo Messico roughly along the lines of early 19th century Texas. The Mississippi Valley itself is poorly represented, as is Florida, whose southern top is a network of islands and canals – a common if primitive attempt to describe the everglades. The lower left bears an interesting title cartouche decorated with curious flora supposedly indigenous to the region. Published in Zatta's 1795 Atlante Novissimo a monumental four volume opus and one of the last great decorative atlases of the 18th century. Zatta A., Atlante Novissimo, 1785. Good. Some soiling and marginal repairs. Original centerfold. Blank on verso. Wheat, C. I., Mapping of the Transmississippi West, 1540 – 1861, #203.